FIVE Wits students have created, funded and developed a safety app called Sizani, through their software company AvoSpace. The app uses geolocations to track emergency assistance in the same vicinity as the crisis. Sizani aims to help people to receive emergency assistance from anywhere. Tracking your geolocation with the press of a button, it connects you to emergency facilities in the surrounding areas by sending a message of distress to them. This alerts them to the situation and they send out the relevant individuals and resources to help those that are distressed. One of the app’s developers, Ishmael Sibisi, said that the creators were inspired by an emergency that occurred last year when a girl fainted outside the Matrix and Campus Control took an hour to arrive. “Everyone always has their phones but no one knows the numbers for emergency services. We want people to just click a button and get help,” Sibisi said. “We are building a community to have a safer South Africa,” said James Ndhlovu, one of the developers for the app. Sibisi told the Wits Vuvuzela that the app was based on the community, people and situations that the creators knew. “We want to start at Wits and slowly branch out. Given the funding, we hope it can go international,” he said. Sibisi and Ndhlovu are third-year Computer Science students and have used their degree towards the app. The pair said their studies ignited a hunger to know more which guided them to learn the technology to create the app. 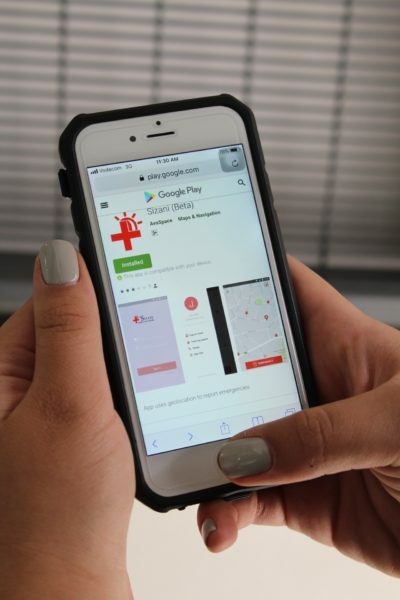 Drama student, Ameerah Moola, said that she didn’t even know what number to call in an emergency situation, so the app would be convenient and beneficial in improving emergency situations in South Africa. Some of the functions they plan to add to fully-launched app include a next-of-kin alert system, tracking SAPS and ambulance services and medical records will be readily available to emergency personal. The app is currently in its testing stages but is available on Google Play. The developers are trying to organise partnerships with ambulance services and the (SAPS), and hope to officially launch the app in July.